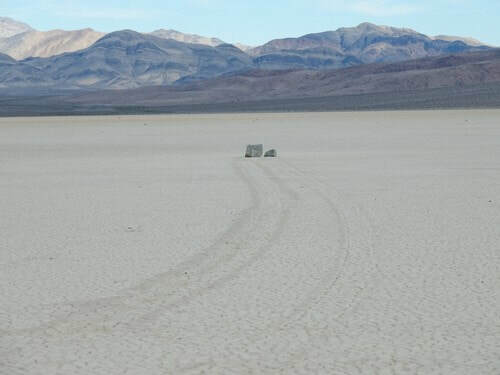 ​"Sailing Stones" on a playa, Lippincott Trail and Ubehebe Crater. This is long trail no matter what way you approach it. 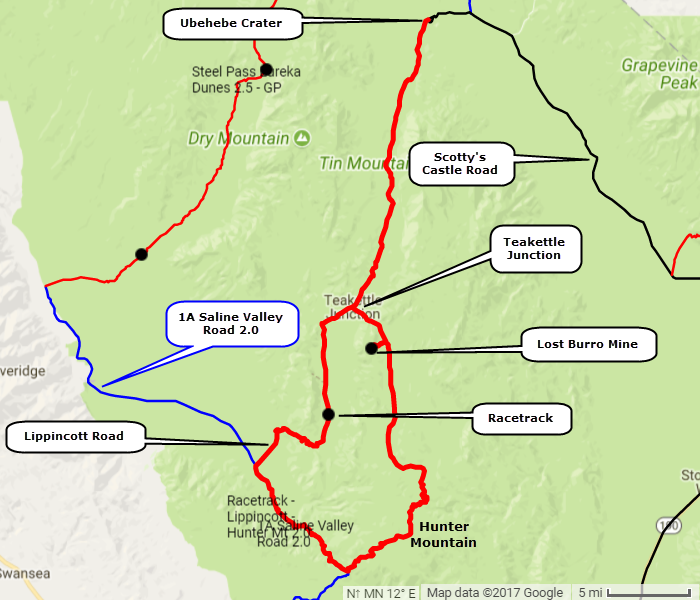 We did it from Stovepipe Wells, passing through Ubehebe Crater in both directions and it was 190 miles. 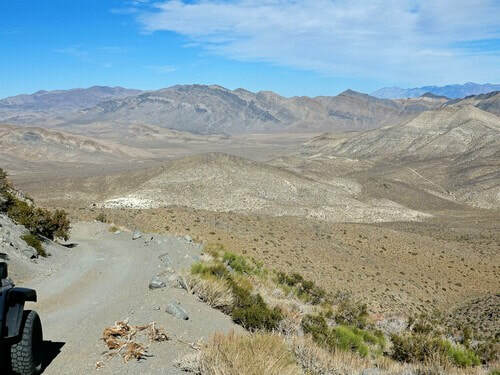 If you start from Highway 190 west of the Park the round trip is 113 miles from Panamint Springs, or 155 miles from Lone Pine - without visiting Ubehebe Crater. There is a GPS - gpx track file at the bottom of the page. 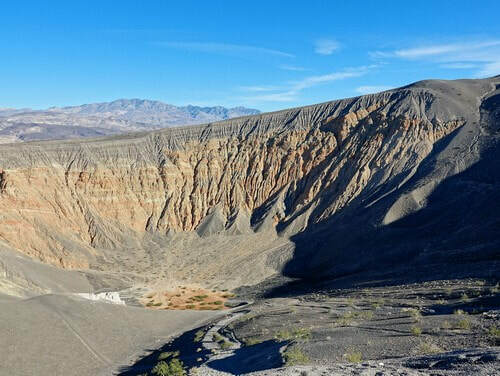 Leave the paved road at Ubehebe Crater and head south. The first 3 miles are the roughest part between the Crater and the Racetrack. If you are comfortable with the first 3 miles you can go to the Racetrack with no problem. 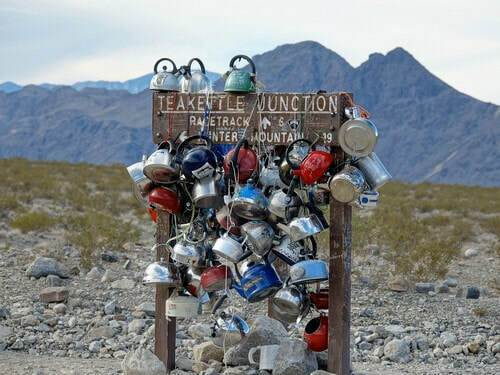 You will pass through Teakettle Junction. 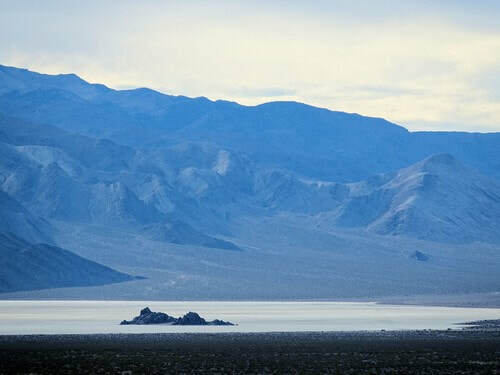 View the "Grandstand" rock formation in the Racetrack Playa as you approach. 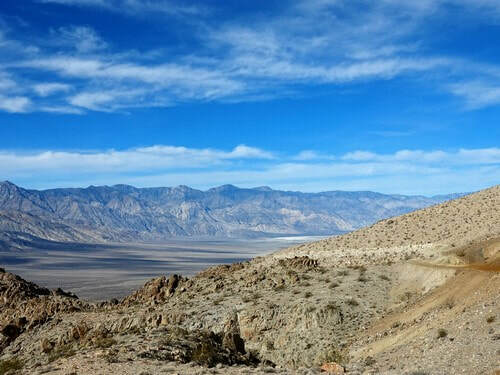 Racetrack Playa is home to one of Death Valley's most enduring mysteries. 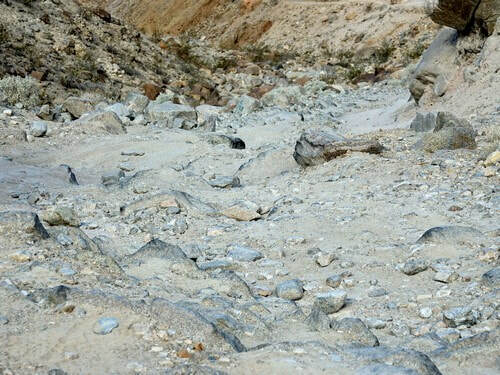 Littered across the flat, dry surface of this dry lake, also called a "playa', are hundreds of rocks –some weighing as much as 320 kilograms (700 pounds) –that seem to have been dragged across the ground, often leaving synchronized trails that can stretch for hundreds of meters. To see the moving rocks, drive two miles south of the Grandstand parking area. 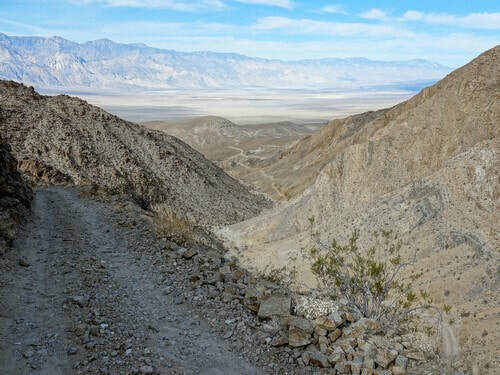 Walk at least a half mile toward the southeast corner of the playa for the best views of rocks and their tracks on the playa. Erosional forces cause rocks from the surrounding mountains to tumble to the surface of the Racetrack. 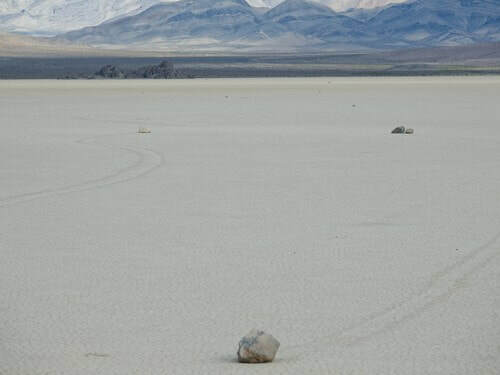 Once on the floor of the playa the rocks move across the level surface leaving trails as records of their movements. Some of the moving rocks are large and have traveled as far as 1,500 feet. Throughout the years many theories have been suggested to explain the mystery of these rock movements. Read this news article to see how the mystery was solved. Be sure to walk the half mile. We did not know this and and only saw a few small rocks near the parking area. Lippincott Road has the reputation of being difficult and dangerous. It is neither if you are careful. The road is plenty wide, but if you do not like shelf roads there will be a serious pucker factor. There are long stretches too narrow to pass another vehicle. 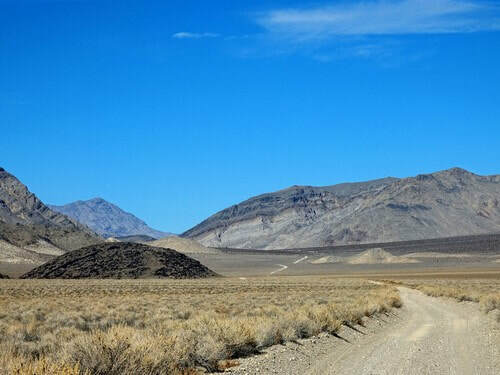 ​The views into Saline Valley are great. This photo shows the most difficult spot on Lippincott as of November, 2017. You need high clearance but not 4WD. 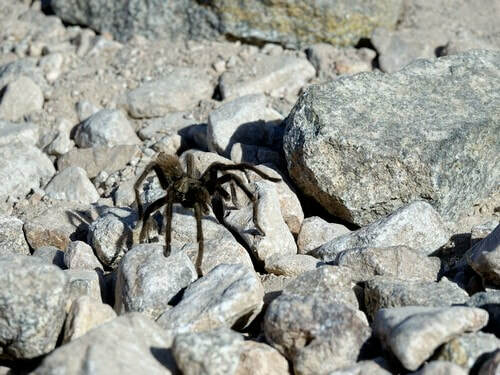 ​This tarantula was a real bonus! 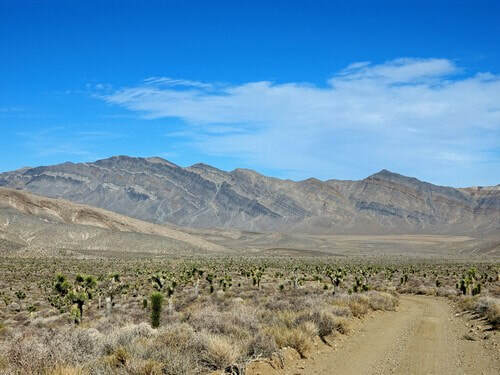 Continue Lippincott Road to the Saline Valley Road and follow it southeast to the Hunter Mountain Road. 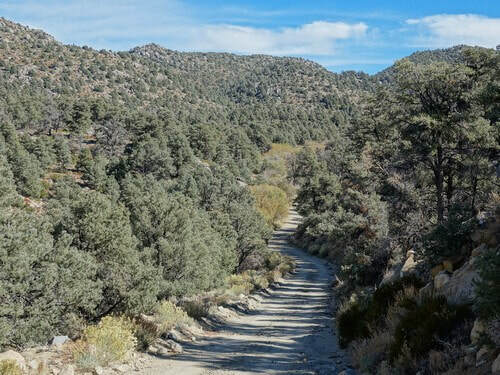 Hunter Mountain is a well graded gravel road that travels through stands of pine at 7,000' elevation before dropping back down. Lost Burro Mine is at the end of a short left hand spur. In 1907 Bert Shively's burro decided he'd had it and went to get himself lost. Bert caught up with him in a remote canyon and picked up a rock to get his attention. He never threw the rock at the animal, it was laced with gold. 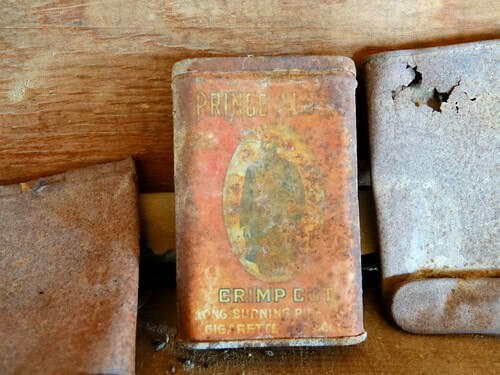 A fifty-ton five-stamp mill was constructed, and mining continued sporadically until the mid-1970s. 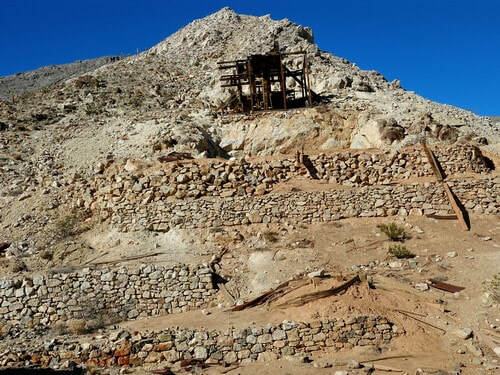 Multiple levels would have supported the stamp mill. 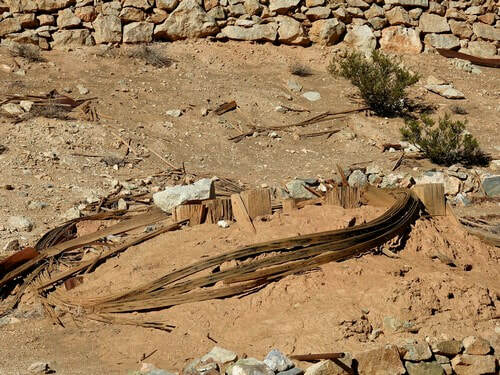 You can still see the remains of a wooden tank. 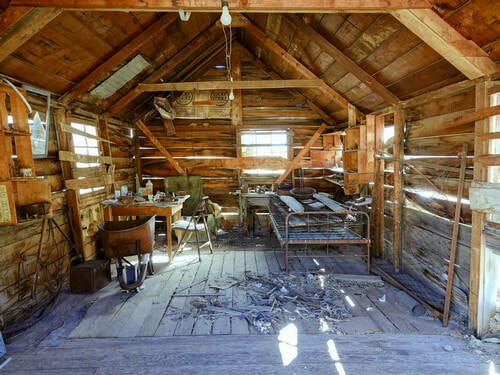 The cabin is "air conditioned" but is in surprisingly good shape. Note the wheelbarrow. "Do you have Prince Albert in a can?" "Better let him out!"